Today, Governor-Elect Bevin announced the appointment of former University of Kentucky quarterback Derrick K. Ramsey to Secretary of the Labor Cabinet. Ramsey brings decades of leadership experience from posts in the public and academic sectors. With a professional career stretching over three decades, Derrick Ramsey’s experiences have ranged from winning Super Bowls, to running collegiate athletic departments, to serving as an official within the Kentucky state government. He returns to the public sector after seven years leading the Coppin State University athletic department in Baltimore, Md. In 2004, Ramsey was named Deputy Secretary of Commerce of Kentucky under Gov. Ernie Fletcher where he oversaw the budget and helped manage the human resources of the cabinet. 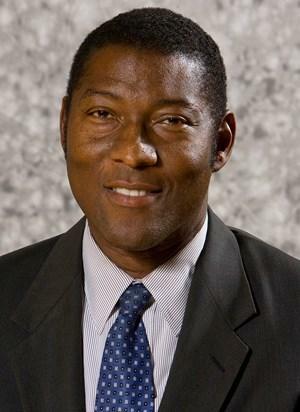 Prior to that Ramsey served as Athletic Director at Kentucky State University from 1999-2003 where he helped develop the Student Athlete Excellence in Academics Program. In the mid-nineties Ramsey was named Community Relations Officer at the University of Kentucky where he later became Director of Development and Community Relations with the responsibility for coordinating fundraising strategies for the Lexington campus as well as strategic planning to ensure endowed professorships and chairs. A native of Hastings, Fla., Ramsey made history at the University of Kentucky becoming the first African-American quarterback in school history, playing under Coach Fran Curci. He went on to the NFL where he helped the Oakland Raiders prevail over the Philadelphia Eagles in the Super Bowl in 1981. He also played for the New England Patriots in another Super Bowl four years later..
Ramsey, 58, earned his Bachelor of Arts Degree in General Studies with an emphasis on Communications from Kentucky and received his Masters Degree in Sports Administration from Eastern Kentucky University. He is a member of the Black Coaches Association as well as the National Football League Players Association. A member of the University of Kentucky Hall of Fame and All-Time Football team, Ramsey had his Kentucky jersey retired in 1992.